The story of the origin of geometry (the measurement of the earth). This is an awesome story to tell with a whole group of children. that has changed very little since 1800 BCE. 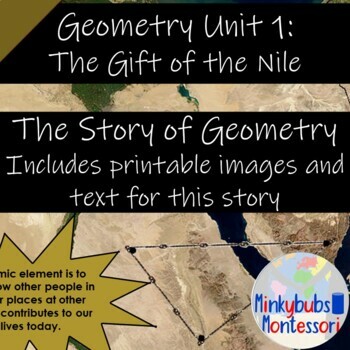 From the Ancient Egyptians to Thales to Pythagorus, the birth of geometry is explained. Included is a story and a series of 7 photographs that can be printed off an laminated onto card to supplement the story. This is a great story to tell before introducing the geometry cabinet.